As a chef, cook, someone who tries to put a well rounded meal on the table, I often need to think up some tasty side dishes to go along with my meals. This family LOVES their carbs, but you can only have mashed potatoes so many times in a week. Fortunately, I discovered egg noodles from Pennsylvania Dutch. Pennsylvania Dutch has been feeding American families for nearly 100 years. Our collection of noodles includes something for everyone and every occasion. Pennsylvania Dutch has a variety of egg noodles you can cook up to serve alongside your meals. From homestyle to fine to Bott Bie (for pot pies) they are a great solution for a side dish. While pasta is typically made from wheat, egg noodles are usually made from eggs and wheat. (By the way, Pennsylvania Dutch offers Whole Grain and yolk Free pastas as well.) The addition of the eggs not only makes the noodles a richer color, but adds more flavor as well. I decided to serve the Pennsylvania Dutch Fine Egg Noodles with some pork chops. These noodles are perfect for stir fry dishes or soups, but I thought the tiny noodles would make the dish more “fun” for people to eat. Because they’re so thin, they cook up in a flash – just 4 minutes in boiling water. The noodles were the perfect side dish for the meal. They were flavorful and tender and tasted great with the pork and the green beans. Another great way to use Pennsylvania Dutch noodles would be to serve it with a thick stew or even chili. For those types of meals, you’ll want to use the thicker egg noodles, such as the Homestyle or Medium Egg Noodles. You can either make your own or use a canned stew. Cook both up and then top the noodles with the stew. That’s next on my “to cook” list. 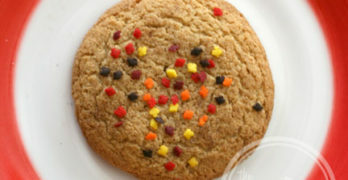 Make sure you check out the Pennsylvania Dutch recipe section for more recipe ideas. 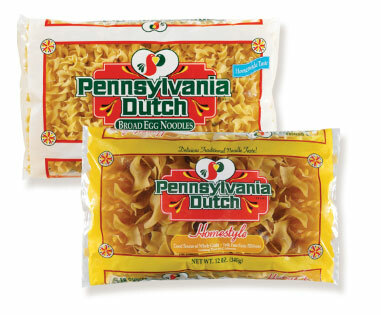 Pennsylvania Dutch noodles are currently available in grocery stores nation-wide. Before you head to the store, make sure you head over to the Pennsylvania Dutch Facebook page to download a coupon for $1.00 off your next Pennsylvania Dutch purchase! I would probably make a chicken stir-fry with them, or maybe chicken stroganoff! I’d make Homestyle Chicken with Noodles. Or Chicken Noodle Soup. I use these a lot to make noodle kugel. I’d either use them to serve creamy chicken on top or for chicken & noodles! I’d make some turkey soup. I would make Beef Stroganoff! I love making chicken & noodles and beef & noodles. I also like to make bolied cabbage & noodles. I would make Beef Stroganoff. Thanks for the giveaway! I’d use the extra wide noodles to make a big pot of chicken pot pie! thanks. I would make Meatball Stroganoff with them. If I won, I wpould make either a big pot of Chicken ‘n Noodles with dumplings OR I would make some Tuna Noodle Casserole! Thanks for the chance to win! I make a tomato and onion pasta dish that’s really yummy…or I make a lot of homemade soups. This would be perfect for some chicken noodle soup! Thanks so much for the chance! In Chicken noodle soup and other homemade soups with home canned tomatoes to make it sooo yummy! 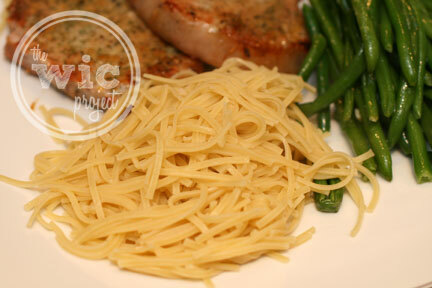 Or with butter and herbs as a side to porkchops like you did! The husband would use these to make chicken and turkey soup. We eat a lot of it when it’s cold out. Great minds think alike. I thought about beef stroganoff before I even saw the previous entry! I would make goolosh or chicken noodle soup. 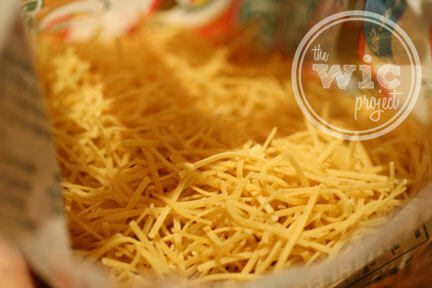 These would be great for Tuno (fake tuna) noodle casserole! yummers!!! Beef noodle soup! It’s in my crock pot now!